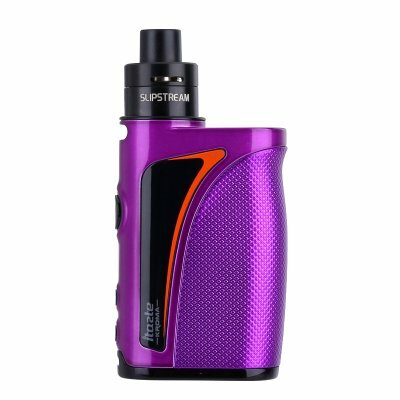 Successfully Added Innokin Kroma Box Mod Kit - 6 To 75W, TC, VV/VW, 2000mAh, Sub-Ohm, 2ML SlipStream Tank, 510 Thread (Purple) to your Shopping Cart. The Kroma Vape kit from Innokin is a mini box mod kit that packs a real punch with its 75Watt Aethon temperature control chipset. This small profile vape has a nice textured grip that is contoured to fit comfortably in your hand so it takes up very little room making it practical for vaping on the go. This vape kit comes with a SlipStream tank that sits partially inside the mod which helps it keep a low profile. Suitable for use with Ni, Ti, and SS coils this complete vaping kit comes with an 0.8 Ohm kanthal coil for sub ohm vaping as well as a 0.5 ohm SS coil for temperature control letting you enjoy both vaping modes right out of the box. Even though this vape is ultra-compact it boasts a substantial 2000mAh battery, which is fast to recharge due to the mods 2 amp micro USB quick charge port. With pass through vaping support, you can also vape while the device is charging which is a nice feature to have. A bright OLD display shows all the important information clearly and the circular + and - buttons let you raise and lower the power in 0.5-watt increments. Coming with a 510 atomizer adapter you can use just about any tank on this mod so you needn't be restricted to the 2ml capacity of the SlipStream tank. Overall the Innokin Kroma Vape is a superb starter kit that's ideal for beginners with a range of features that make it a solid choice for intermediate and advanced vapers who want a stealth backup device. The Kroma Vape kit comes with 12 months warranty, brought to you by the leader in electronic cigarettes as well as wholesale vape kits.